Cover Run celebrates and profiles the awesome work (both sung and unsung), of cover artists even the best interior pencillers wouldn't mind stepping aside for. 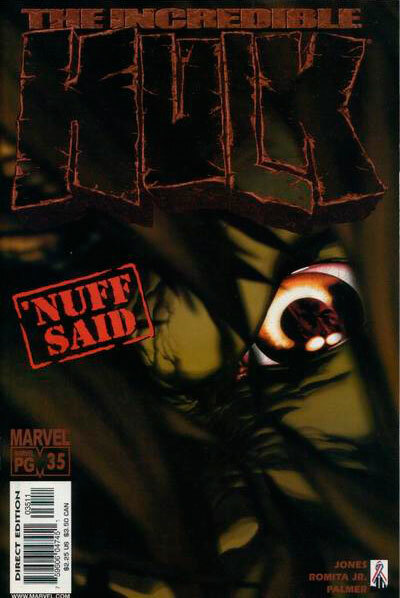 This month the spotlight turns to the iconic imagery of Kaare Andrews on Incredible Hulk vol 2 issues 34-54. I have mad love for the Hulk, and think of him as both Marvel's biggest icon and contribution to pop-culture (Sorry Spidey). While writer Bruce Jones' run on the character took Bruce Banner down more of a Vertigo-esque path than the Jade Giant is used to, cover artist Kaaree Andrews added to the atmosphere with unpredictable covers that grabbed your corneas month to month - and never let go. Sure the run started off with a homage to Jim Steranko (third from left above), but from there on out no subject was safe. Pulp movie posters, children's books, even cereal boxes fell before Andrews pen and the results went beyond typical superhero fare. A more Fringe/Bourne Identity feel wasn't just in the content, it was in the covers as well. The powers that be also eased up on the trade dress for the book, which nicely allowed the logo to be worked into the overall design and theme of each look. Laid out in front of me now it makes for one impressive portfolio range (click to enlarge all covers in this post). 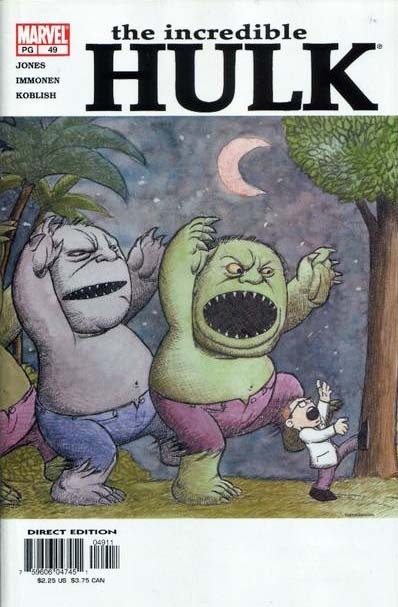 While I've never looked at the Hulk/Banner/Mr.Fixit relationship the same since the Where The Wild Things Are tribute, my pick of the bunch is the cover from the silent 'Nuff Said' issue. HULK SMASH! For more Hulk-amania bash on over to the Incredible Hulk Library! Those are so...imaginative doesn't even cover it. Brilliant doesn't really cover it. Strange and amazing...and...Marvel doesn't deserve an artist this great. That being said, I'm so glad they have Andrews. Thanks Random - glad you see them like I do! I've noticed since posting this even more of my favourite covers are by Andrews - a talented dude indeed! The OCD in me wants the whole set. Just great stuff. Ha - trust me Craig - as a guy who laid them all out on the floor as I typed this post they do make a pretty sweet spread. Would be cool to frame them in place ceiling to floor, but then I'd never get to read them!